This subscription provides both summaries and full text of current and archived bills from all 50 states and the U.S. Congress. You'll also have access to summaries and full text of bills, archives, and statutes, enacted public laws, U.S. Code Congressional and Administrative News (U.S.C.C. & A.N. ), Presidential documents, and specialized materials regarding specialized legislative initiatives. 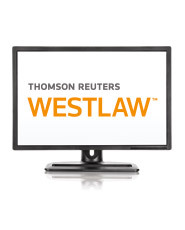 WestlawNext™ builds on Westlaw's strengths to bring you the next evolution of legal research. Now searches are even more intuitive and efficient, and results even more inclusive and relevant. So you'll have confidence that a simple word search delivers the documents you need. Other content on WestlawNext is also available to you at additional charges based on Westlaw plan inclusion. If you link outside your subscription content, messages will inform you that you will be billed at regular WestlawNext rates.